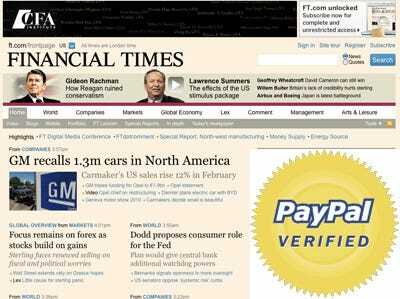 Financial Times has pulled another stingy tweak on its Web site: Unregistered users will no longer be able to view free articles. FT.com has been offering five free articles a month to unregistered users, while free, registered users got to see 25 articles. Now casual readers have to sign up to browse the site, and they can only see 10 articles per month. As paidContent points out, the Financial Times has seen their traffic grow, with 1.9 million users signing up for free accounts. They want more demographic data so they can land more lucrative advertising deals. They are hoping more people will sign up for free accounts to give them the information they need. The only way unregistered users will be able to browse the site for free is if they come through Google, under FT.com’s First-Click-Free program.